When you are working on a concrete project such as pouring a foundation, laying a patio or building a planter, there will be instances when you accidentally spill concrete in unwanted places. Depending on the condition of the concrete, clean up differs slightly. Wet concrete is more easily cleaned up than set concrete. If the concrete is still damp, douse it with water liberally to dilute it. Fill a bucket full of water and pour it directly onto the spill. Scrape up the concrete with a plastic putty knife whilst continuing to dilute it with water. Scrape vigorously to remove the moistened cement, throwing the spilled pieces into another bucket. Using a stiff-bristled brush, remove any remaining wet concrete. Cover with water if necessary to lift all the wet concrete.Continue to brush, adding water until the spill is gone. 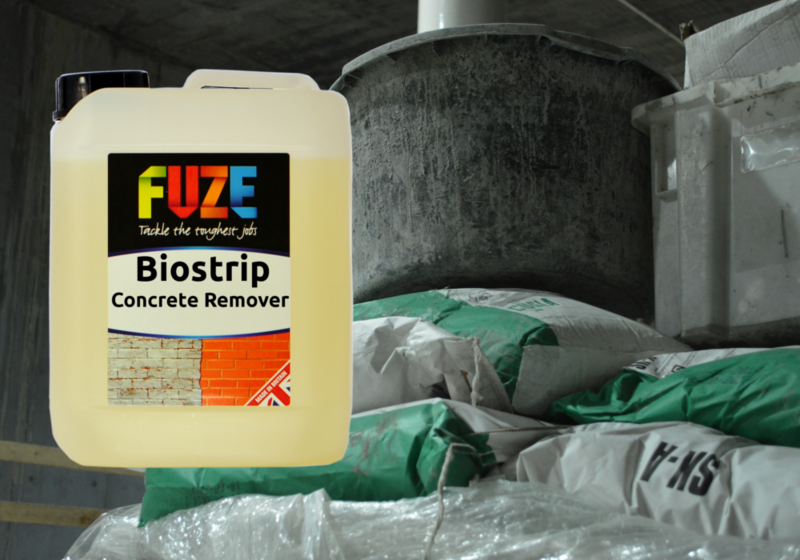 Pour Fuze Products Concrete Remover onto the dried concrete and allow it to soak in for 5 to 10 minutes. This product will react with the dried concrete and turn it into a gel. Break up any remaining residue with a stiff bristled brush or chisel. Start from the top of the spill and work toward the bottom. Do not start at the bottom or you may chip or scratch the floor underneath.